Austin Vesely went from making music videos to writing his first movie, Slice. Werewolves, murder, a high-profile rapper: on paper, those elements combined read like those of a major motion picture. In reality, however, they're the foundation of the debut film from Chicago-based director Austin Vesely. Set to feature former FADER cover star Chance the Rapper as the aforementioned werewolf, Slice unfolds in a Middle America town where supernatural occurrences are part of everyday life. Vesely had one major advantage when approaching his first-ever feature-length film: he came up alongside Chance the Rapper, Vic Mensa, and Donnie Trumpet, having directed early music videos for them. So when he was ready to switch over to film, Chance was a natural choice. Here, Vesely breaks down the story behind the film, which is slated to start shooting in late fall—another reason, he says, that it will have a "nice Halloween vibe." 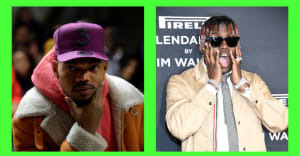 When did you first connect with Chance the Rapper, Vic Mensa and Donnie Trumpet? I started working with those guys in summer of 2011. I went on tour with Kids These Days, which is the band Vic and Nico (Donnie Trumpet) were both in, and we vibed with each other. I ended up making my first music video for Nico’s song that he did with Vic, “Clear Eyes.” That was my first big thing to do in the Chicago scene. Have you always been interested in film? Yeah, it’s something I’ve always done my whole life. When I was a little kid, my grandma left her video camera at our house and it was the most fun thing I’d ever encountered. Then I went through other phases, like music, but by the time I was getting ready to go to college, I ended up coming to Columbia College in Chicago to do film. Early on, it was very much Kids These Days and Chance the Rapper-centric. I met Chance at that first video shoot and when he showed me his music I was super excited about it. I made his first video. Chance and Vic have been the main collaborators along the way. Music videos came up as sort of a happy accident. I met some people who were working in that community in Chicago and it was a good way to practice my craft professionally and also while in school. It just happened to be that it was this really amazing time in the Chicago music scene when all of these artists were coming up. I got to grow as a filmmaker with them. All along, it was waiting for the right moment to be able to reach into the fictional film world. Where did the idea for Slice come from? I had some drunk notes scribbled in a notebook from way back that said, “Person orders pizza to houses. Kills the driver.” I thought it was a weird idea for a short horror film, so I wrote it as that in different versions and then wanted to see if I could adapt it to a TV show and then I finally decided to adapt it into a feature. When did Chance enter into the picture? How much did he work with you on the writing for the character? Is it based on any real-life moments or quirks? I wanted to tailor the character’s voice to him, but the world the film takes place in is very supernatural and strange so it isn’t Chance the Rapper in the film. We wanted to give him challenges but also tailor it to his voice. He hasn’t really been involved with the writing up to this point, but, as we move into production, we’re going to go over scenes together and decide what works best for him. How will you achieve the level of special effects you want with a first-time budget? Luckily we’ve got a lot of people who are taking interest early, particularly with Chance’s involvement. My production designer, cinematographer, and I had initial meetings last week. My production designer is the same one who did the music video for “Sunday Candy,” and she just blew that totally out of the water. So I have really great faith in her skills that she’ll be able to create this alternate setting. It’s just a skew of reality that we’re creating. It’s all very grassroots, I guess. It’s a bunch of people who’ve been working together for a long time, coming together on a larger scale and having fun with it. By the look of the poster, Chance will be riding a motorcycle. Is he going to do his own stunts? There’s a good chase scene in there. I had showed Chance a recent draft of the poster, but he hadn’t read the script yet, and he was like, “So do I have a bike in the movie? My dad always told me never to ride one of those.” I thought, This could be an issue, but we’ll work it out even if we need a stunt double. What was the visual inspiration for the artwork? I spoke to this guy named Alexander Iaccarino. He’s based in Austin, Texas but I know him from when I lived in Iowa for awhile. He’s done some interesting horror-centric art and I was waiting for an opportunity to utilize him. I told him about the film and he went with a grindhouse style. We’re hoping we’ll create a series of these as casting continues and we’ll roll out actors. Are there going to be any other rappers in the film? I’ve been hoping I can get Vic [Mensa] to pick up a role. I haven’t talked to him yet. I’ve talked a bit to Hannibal Burress. We’re hoping to get him involved. He directed a Chance video with me a couple of years ago so he’s a close buddy. What movies did you grow up loving that you going to reference in this film? Image-wise, it’s just short of the height and style of some of the earlier Tim Burton stuff like Beetlejuice and Edward Scissorhands. We want to tie in that idealistic imagery in our own way. We want the setting to be a mediocre town where really interesting things happen, but treat it sort of as normal. Shaun of the Dead is kind of like a spiritual cousin to this movie. Is the setting going to be in the Chicago area or will it be more vague? It’s going to be kind of ambiguous. It’s a fictional town. We want to shoot around here but we’re kind of in a predicament. Chicago has a really good tax incentive for film, it’s like 30%, and that would really help a film of our scale but the governor has frozen that incentive right now so we’re having to loop at other options unfortunately. The goal has always been to do it here so we hope that gets sorted out. And finally, will you be deferring to Chance for the soundtrack? Yeah, I’ve talked to him about doing it. I know it’s something he’s interested in and there’s great potential for that. I want to get all my Chicago music friends involved with that. Macie Stewart and the band Marrow are people I’ve talked to extensively about it. We’re going to keep it homegrown.